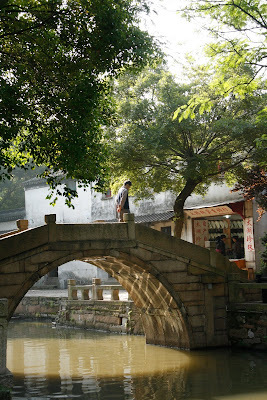 We escaped Shanghai this weekend for Tongli - a beautiful water town just an hour and a half away. Everyone who visits Shanghai for more than a few days wants to see a water town and they are all equally charming as a day trip. But the real beauty of Tongli lies in the fact that it is just a little further from Shanghai than the others, so it attracts slightly fewer visitors, and after the day-trippers go home in the afternoon you can have the place to yourself. The ancient village of Tongli was built around a maze of small canals, and connected with the Grand Canal linking Hangzhou and Beijing. Everyday life centres around the canals now just as it did then, with clothes being washed, fish being caught and ducks being plucked and gutted by the water's edge. In the afternoon's soft sunlight you can wander lazily along the many canals, drink some oolong tea then stop for a delicious dinner at any of the outdoor restaurants lining the canals. 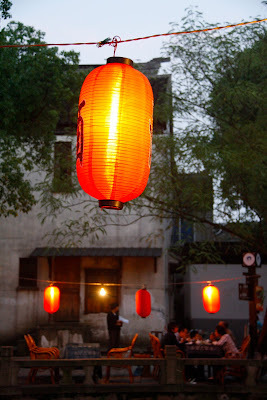 By the light of a red lantern you can appreciate the local specialty - Wansan pork. I am embarrassed to say I ate it three times in less than thirty-six hours. It's a pork shank cooked slowly in a sweet aromatic soy braise until the meat is ready to fall off the bone, and it is best savoured whilst also enjoying an ice-cold tsingtao beer as the stars come out and the oars of the pleasure boats dip quietly in and out of the water.